How many trees are needed to produce enough oxygen for one person? Breathe in, you’re in for a big surprise when you find out how many trees we need to keep our lungs filled with delicious oxygen! Trees release oxygen when they use energy from sunlight to make glucose from carbon dioxide and water. 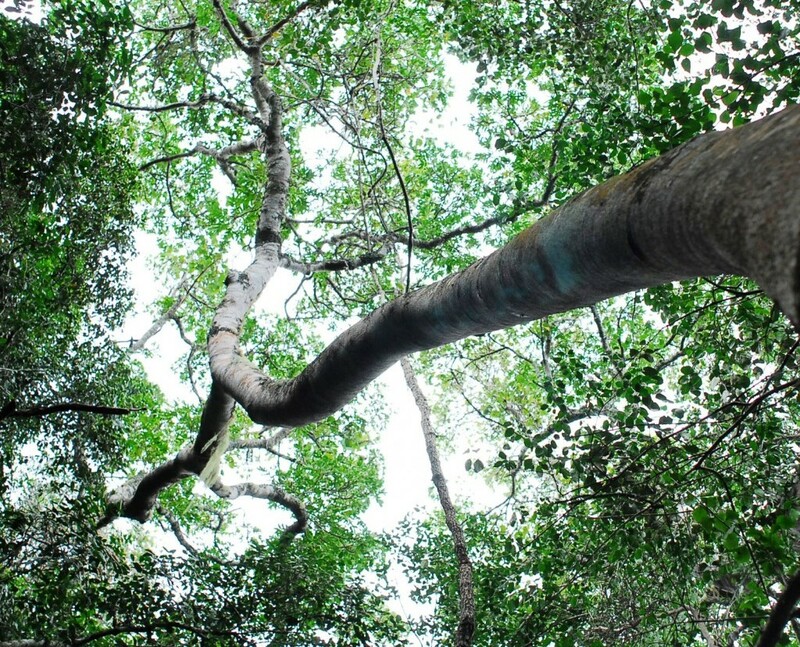 Like all plants, trees also use oxygen when they split glucose back down to release energy to power their metabolisms. Averaged over a 24-hour period, they produce more oxygen than they use up; otherwise there would be no net gain in growth. It takes six molecules of CO2 to produce one molecule of glucose by photosynthesis, and six molecules of oxygen are released as a by-product. A glucose molecule contains six carbon atoms, so that’s a net gain of one molecule of oxygen for every atom of carbon added to the tree. A mature sycamore tree might be around 12m tall and weigh two tons, including the roots and leaves. If it grows by five per cent each year, it will produce around 100kg of wood, of which 38kg will be carbon. Allowing for the relative molecular weights of oxygen and carbon, this equates to 100kg of oxygen per tree per year. A human breathes about 9.5 tons of air in a year, but oxygen only makes up about 23 percent of that air, by mass, and we only extract a little over a third of the oxygen from each breath. That works out to a total of about 740kg of oxygen per year. This is about seven or eight trees’ worth. But, this gets so much more interesting! Trees can’t take credit for all the oxygen in the world. In fact, algae and other marine plants produce an estimated 70 percent of Earth’s oxygen through the photosynthesis process that takes place in oceans. Without trees, however, the air we all depend on would be rather thin. Trees absorb carbon dioxide through their leaves and break it down, releasing oxygen into the air. One mature tree can produce enough oxygen for up to 18 people, depending on the size and type of tree. Together with other plants, trees have created enough oxygen to fill up one-fifth of the Earth’s atmosphere. That makes our planet the only member of the solar system with so much oxygen for living organisms. Scientists are now studying what happens when warming oceans kill phytoplankton, which account for half of the Earth’s oxygen and — most important — form the basis of marine ecosystems. Interestingly, trees can play a role here, too. By planting more trees and halting deforestation, we’ll reduce the greenhouse gas emissions that are causing the oceans to warm and oxygen-producing plankton to die. This awesome information was found at http://sciencefocus.com and http://iipdigital.usembassy.gov written by Karin Rives for IIP digital. This entry was posted in Eco awareness, Green Thumbs and tagged healing trees, Oxygen, trees. Bookmark the permalink.